Make a career out of writing and taking photographs. Photojournalists work in publishing (electronic or print media) either self employed (freelance) or in house (employed by a publisher); contributing images and (in smaller enterprises), writing as well to published work. Opportunities are relatively strong and diverse for skilled photographers, but for the person who can also write text and process images using software, demand for this mix of skills has been very high. 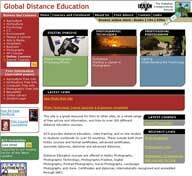 Become a Photojournalist - study by Distance Learning. This course teaches you the skills necessary to become a photojournalist. A broad based, practically oriented training course that will develop the essential skills required to work in this field. The student will develop a variety of written and photographic work that can be used as the basis for a professional portfolio. Students study 19 Core Modules, plus 1 Elective Module, and a Workplace Project. To complete the diploma you are required to complete 2100 hours of study - a total of 20 Modules, plus a Workplace Project. You will also complete 100 hours of industry project work. More information on this is given can be found on the Workplace Projects page. But don’t worry if you are not too clear on this at this stage, your tutor will be there to help and advise you all the way. For example, a portrait photographer is also documenting an event, but their responsibility is to the client and what the client wants to see. A journalist, on the other hand produces news for the public, and should be accurate. A photojournalist also has a responsibility to put things into context. Modern photojournalism began in Germany in 1925, when the first 35mm camera – the Leica, was invented. Prior to this, a photographer would have to carry bulky equipment, but with this new camera, the photographer could take photos unobtrusively and without carrying lots of bulky cameras and tripods. This allowed for photos to become more natural and show how people really lived, rather than the mainly posed photographs taken previously. Another important invention in the mid-1920s, also in Germany, was the first photojournalism magazine. Rather than the odd photo or illustration, these magazines told stories with pictures and words. The photographer would shoot more photos than needed. The editor would then examine the contact sheets (these are sheets of photographs in miniature form). The editor would then choose those that he/she believed told the story. The layout was important and the written story was kept to a minimum. Newspapers and magazines continue to make heavy use of photographs. One photograph can tell so much more than words. Nowadays newspapers and magazines will often not rely so heavily on just photographs - they will also make use of words and images to add more to their content. Technology has dramatically changed photography. With the advent of digital cameras, photography changed rapidly. Most photographers used colour photographs without needing to print them all. A photographer could now take many images of the same event, then choose the best ones. This has led to a rapid improvement in the quality of images presented. Understand the market - know what publishers want. Develop your skills to meet the needs of publishers. Develop your skills and knowledge in wide range of areas - photography, project management, adding and amending website content, how to organise and manage projects, marketing and much more. Learn about networking and establishing contacts and relationships in the industry. If you have any questions or want to know more about the course or its components, then please get in touch with us today. Connect with our specialist tutors who have helped develop the course and who provide support and guidance to our students throughout their studies; they will be happy to help you.